I love going out to eat, and when I do, I tend to splurge a bit and over-order since I don't go out as often as I would like (mostly to save my bank account and my waistline). And so, going out is still very much a treat for me. In order to eat as much as I want without feeling guilty about it later, I like to take a lot of long walks, usually with my husband and Leo (our beagle), to enjoy the fresh air and burn off some calories. 1. Schlosspark -- The Schlosspark is my favorite walk because it's close to my house and runs a good, long circuit through the city. I like to start at the Neues Schloss and walk past the Opernhaus, across the bridge, past the new Hauptbahnhof construction, and down through the park. Along the way I'll pass several lakes and fields, as well as the public grilling space and giant wooden play castle for kids, all the way to the Mineralbäder u-bahn stop. It's a nice, flat three-kilometer stroll under the trees with plenty of wildlife and green views to keep me occupied. Of course, you can always walk back and double the distance if you're feeling particularly ambitious. Plus, this walk is very safe during the day as there are usually lots of joggers and other strollers around. 2. Killesbergpark -- This was one of the first parks I walked through when we arrived in Stuttgart a little over two years ago. The park is very easy to get to from the Killesberg u-bahn stop. From there, you can walk up through the new housing and business complex through the back entrance of the pack. There's an outdoor theater there where we saw Feist perform once, as well as a rose garden, a railroad line for children (though I think it only runs on the weekends), a small carnival with a merry-go-round and puppet theater, and several large pens with animals likes llamas, goats, pigs, flamingos, and ponies, making this a great park for children. Definitely be sure to go up the top of the double-helix tower for a lovely view over the city. Best of all, Killesbergpark was the site of a horticultural show in 1939, so it continues to show off various plant exhibitions throughout the year. If you go any time from about April through September, you'll get the chance to enjoy one of the many lovely flower displays in the park. 3. Rosensteinpark -- This park is the location of the Rosenstein Palace built in 1830, though the palace is now part of the Museum of Natural History. Next to the palace is a large English-style rose garden that's lovely to walk through, and the grounds next to the palace are huge. You can enjoy some of the largest green spaces in Stuttgart there with ancient trees and even a hare or two among the tall grasses. You can easily get to Rosensteinpark from the Rosenstein, Löwentor, or Wilhelma u-bahn stops. I should note that Rosensteinpark is also connected to the Schlosspark and Killesbergpark, so if you're got a lot of energy and have a couple of hours to kill, you can walk through all three parks in one go. 4. Weißenburgpark -- This park is the location of the Teehaus, which I've blogged about before because of their delicious food and lovely biergarten. Even if you're not interested in going there for a meal, the small park is lovely and offers a gorgeous view of the city. Just be forewarned that the walk up the hill is pretty steep, so it's a good idea to bring some good walking shoes and some water for this one (or you could just buy a beer when you get to the top). 5. Fernsehturm & Weinsteige -- Stuttgart's iconic Fernsehturm (TV tower) is surrounded by many kilometers of trails. I haven't even been through half of them, but there are two walks that I really enjoy. The first goes from Degerloch, down past the Weinsteige u-bahn stop through the forest trails and past the vineyards and ends at the Bopser u-bahn stop. The second begins at the Fernsehturm and winds down through the forest trails until you end up again at Bopser, though you can also bear left and go up to the Teehaus. Either way, there's tons of green to explore in this area. Just be sure to bring your muddy hiking shoes for this one. 6. Max-Eyth-See -- Matt and I discovered this man-made lake after a beer and wurst cruise that we took up the Neckar. 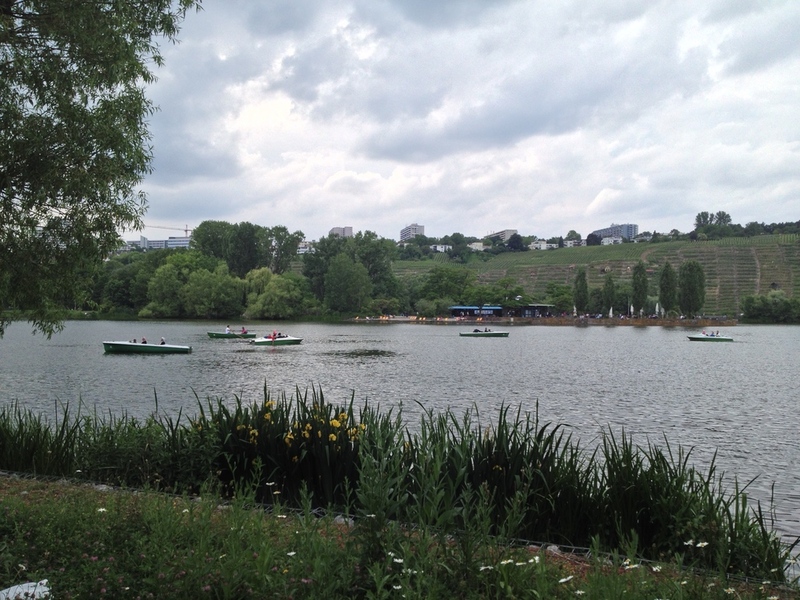 The lake is absolutely beautiful, and there are plenty of biergartens and paddle-boats to keep you occupied during the summer. I like to walk the flat two-kilometer trail around the lake on the weekends when the weather is nice. There are also usually lots of families and picnickers, making this another family-friendly walk during the day. Max-Eyth-See is about a 20-minute ride from the main station, so just be prepared for a longish journey to get there. 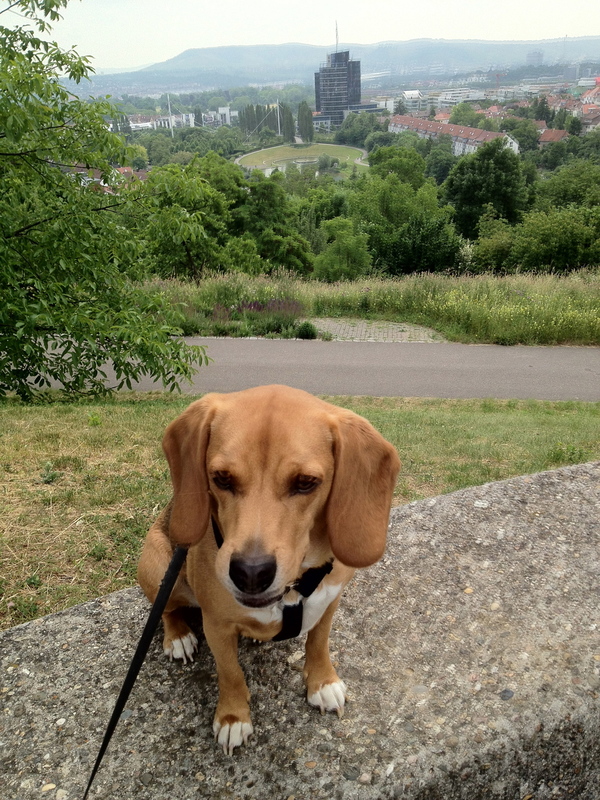 Do you have any favorite walks in Stuttgart? Share you're in the comments below!